Don’t cook hot dogs and buns on the grill. I’m an avid grillsman, but there’s a much better way to prepare them. 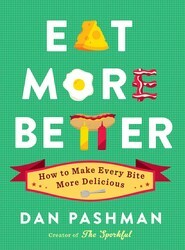 Here’s how, from Eat More Better. Because hot dogs come precooked and contain enough fat to retain juice under the most adverse circumstances, and because most buns are awful to begin with, little thought is put into the preparation of these staples. 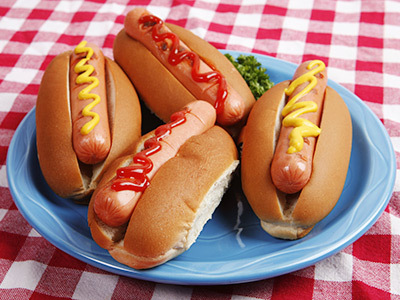 Grilling hot dogs is far more likely to dry them out, or at least leave them much less juicy than if you boil or steam them, which are better methods. The only good argument in favor of the flame is that the process adds some crispy texture and char-grilled flavor. To that I would counter that hot dogs with a natural casing offer a unique textural sensation far preferable to that of a grill-induced crisp, and char flavor is better suited to foods with a lower surface-area-to-volume ratio (SATVOR), where it’s less apt to overpower. The argument in favor of grilling buns is even less persuasive. If you want buns to be toasted, griddle them in a pan on the stove, with plenty of butter. This way you’re adding moisture and flavor instead of sapping it, while still imparting texture and warmth. You can also steam buns by microwaving them in their plastic bag. Or make sun-steamed buns by leaving them in their bag in the sun. When moisture beads up on the inside of the bag, the buns are ready. Have you noticed a pattern here? Neanderthals may have grilled a mean meat stick back in their day, but now we know that both hot dogs and buns are better when you cook them using a stove, indoors. That, dear pupils, is progress. TIP: Choose potato buns for hot dogs and burgers. They’re more moist, flavorful, and sturdy than their standard-issue counterparts.